About 20 percent of cultivated agricultural land in the United States contains saline levels that are high enough to affect crop yields as of 2010. Because salts dissolve easily in water, they can be carried by irrigation to crops, where they can build up to toxic levels in cultivated soil. This is especially true if there is clay or a hard layer of dirt that prevents the salts from leaching below the root zone. Sodium chloride and sodium sulfate are two such salts to which crops like pea plants are particularly sensitive. Salts form from chemical reactions between acids and bases. Sodium chloride, also known as "table salt," dissolves in water to form positively charged sodium (Na+) atoms and negatively charged chloride (Cl-) atoms. Likewise, sodium sulfates break up into sodium and sulfate (SO4-). It is the sodium that it most harmful to most plants. Peas grow rapidly on a single main stem, with many branching leaves. It's not unusual for these stems to reach several feet in height, or for multiple flowers to grow on a single branch. Each flower readily self-pollinates even as it forms, so its potential to form a seed pod is very high. Peas are legumes, which means they can fix their own nitrogen, and thrive in poor soils. For the most part, peas are a hardy, productive plant. However, they need copious amounts of potassium to catalyze enzyme reactions that drive their rapid growth. The sodium in salts is chemically similar to potassium and readily displaces it in plant cells, crippling the pea plant's ability to grow. Salt contains dehydrating effects. Water that comes into contact with a higher concentration of salt, will be drawn toward it. As a result, even though there appears to be adequate moisture in the soil, pea plants will be parched anyway, if saline concentrations are high enough. Pea plants respond to water loss by producing osmolyte molecules called proline which stabilize cell walls against osmosis. The stomata in leaves close to reduce water loss through vapor transpiration. This works well to protect the plant through a hot afternoon, but trapping water in also traps other things out, including nutrients and gasses. Carbon dioxide and water are needed for photosynthesis, so pea plants quickly lose their ability to create food energy when saline concentrations are too high. Pea plants experiencing mild salt poisoning take on a blue-green hue as green chlorophyll in the plants is affected. Stems and leaves of the pea plants rely on water to maintain cell rigidity, and so will wilt dramatically from salt poisoning. Growth will be slow and stunted and roots will not deepen as potassium is displaced by sodium. As photosynthesis slows, chlorophyll will be destroyed, so pea plant leaves will yellow. Flowers will be few or never form at all. 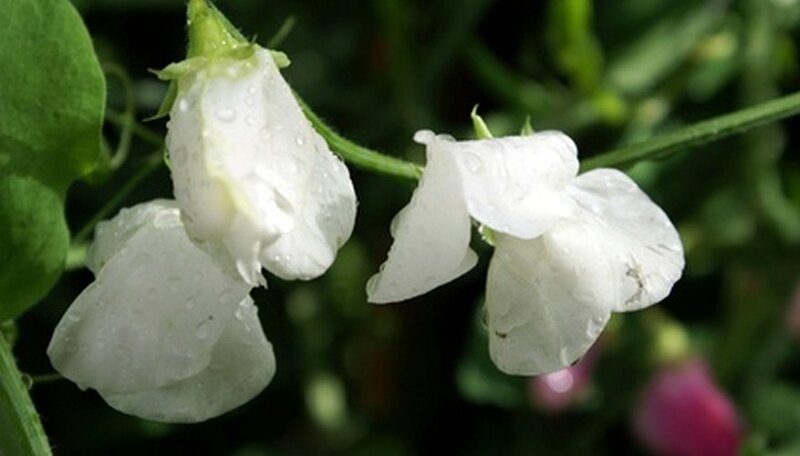 Depending on the saline concentration or length of exposure, pea plants will shrivel and die.